Greg Shaw (1949-2004) should need no introduction here. 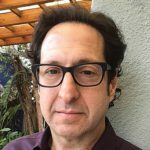 After rolling out one of the seminal rock fanzines, Who Put the Bomp (and its late ‘60s predecessor Mojo Navigator), he founded Bomp Records in 1974, one of the most respected independent labels of the era, releasing records by the likes of the Flamin’ Groovies, Devo, the Weirdos, DMZ, Iggy & the Stooges, and a band from Chula Vista, California called the Zeros. 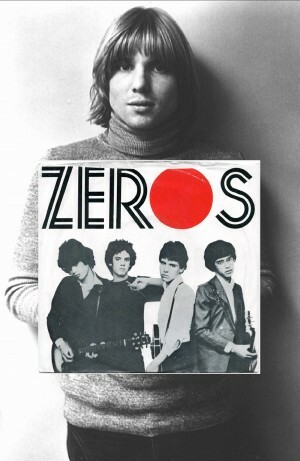 Part of Southern California’s first wave of punk rock bands, the Zeros released two singles on Shaw’s label: “Wimp” b/w “Don’t Push Me Around” in 1977, and “Beat Your Heart Out” b/w “Wild Weekend.” Both are widely regarded as among the best American punk singles of the late ‘70s. The Zeros’ place in rock ‘n’ roll history was already etched in stone by the time the original band broke up around 1981. 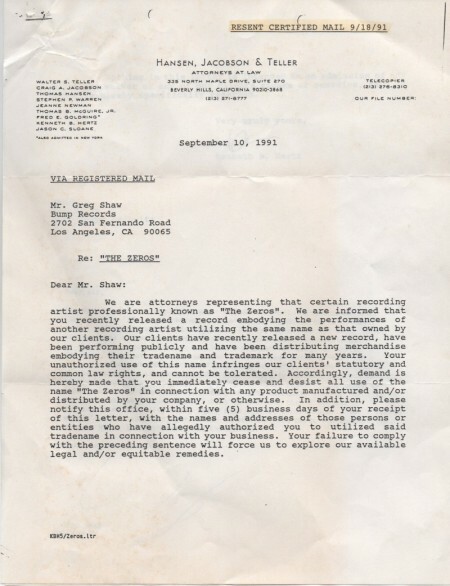 So ten years later, having recently releasing an LP anthology of the band’s recordings, Shaw was surprised to receive a letter from some high-powered Beverly Hills attorneys threatening legal action because the name “Zeros” infringed on the “statutory and common law rights” of their clients, a new band of apparently uninformed LA metal douche-bags who were calling themselves… the Zeros. Greg was never one to concern himself with legal niceties so he took to his typewriter and bashed out a response in short order. It’s classic Greg Shaw. The original Zeros—Javier Escovedo, Robert Lopez, Hector Penalosa and Baba Chenelle—continue to be musically active in various forms. Escovedo recently released a new album, Kicked Out of Eden. Lopez is world famous as El Vez. Penalosa plays with the Baja Bugs. And various configurations of ex-members still play occasionally as the Zeros. 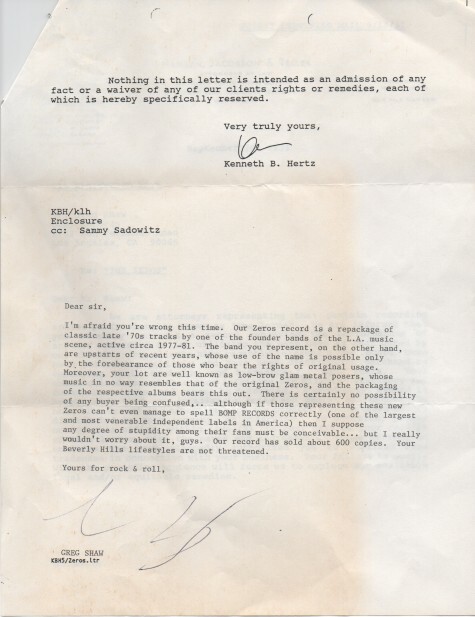 Both letters are reproduced here for your pleasure by permission of Suzy Shaw at Bomp Records.